This article by my husband Anthony describes an event sponsored by the North Fair Oaks Empowerment Project that took place at Greater New Guide Baptist Church. We are both delighted that his article appeared in “a locally owned and operated independent African American newspaper” that has served our community well for many years. Kudos to all who made this remarkable event a success, especially the Interdenominational Ministerial Alliance,Pastor Sterling Brown, Pastor John Bledsoe, and our team of dedicated community residents and leaders. “I am the only African American scholar to have done doctoral work on the Dead Sea Scrolls,” Dr. Jamal-Dominique Hopkins told his audience on July 24, 2015, when he spoke at Greater New Guide Baptist Church in Altadena, a small but Spirit-filled church led by Pastor Sterling Brown. Dr. Hopkins’ talk was sponsored by the North Fair Oaks Empowerment Initiative, which is supported by the Interdenominational Ministerial Alliance (IMA), the oldest association of African American pastors in Pasadena. 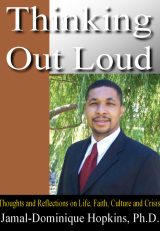 A nationally known scholar and public intellectual, Dr. Hopkins not only earned his Ph.D. from the University of Manchester, he also started a non-profit think tank, the Institute for Advanced African American Christian Thought, and is the author of Ten Things Every Christian Should Know and Thinking Out Loud: Reﬂections on Life, Faith, Culture and Crisis.